MORVERN POTTERY at Rhemore in Morvern, Scotland - and at his studio at The Knott in Cumbria - is where Chris Barnes makes his Stoneware and Raku pots. See video clips of work in progress below. 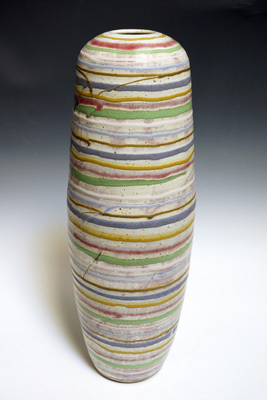 The Stoneware My work includes a range of hand thrown and fired one off bowls, vases & plates. 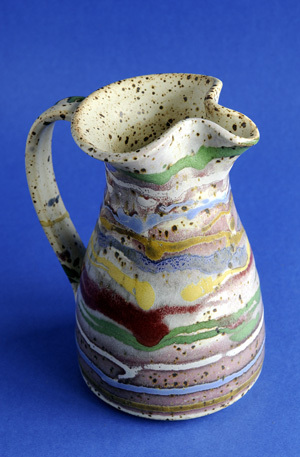 These simple forms show off various glazes, which were developed to exploit the colour potential of reduction firing. The coloured glazes are formulated from different minerals which bring out particular hues from their colouring oxides. This gives the colour responses in the glazes a depth and intensity not possible with stains. 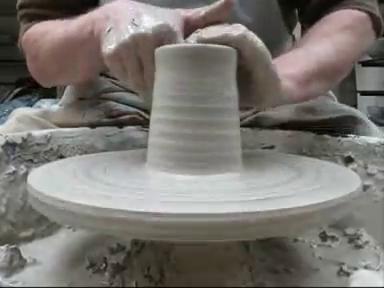 The potters' wheel is only a partial mechanisation of making, allowing the hand of the potter into the process. Hand throwing gives every piece a unique character. It allows for subtle variation. The softness and tremor of the hands and fingertips shape the forms, giving each piece individuality. After the first firing, glaze is applied by dipping the pots in an initial coating of white feldspathic glaze. Then a reactive transparent glaze is added on top of the white base layer to give depth to the surface. 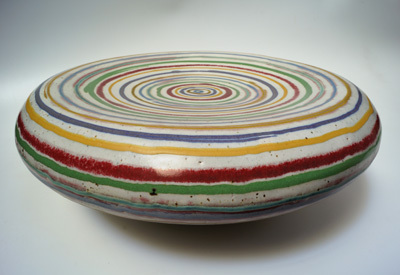 Finally, by spinning the circular forms, sumptuous bands of colour can be squirted onto the pots. 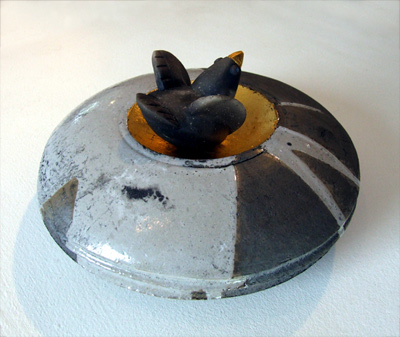 This squirting, or trailing process allows the coloured glazes to be built up to a sufficient thickness for strong colour to develop in the final firing. Individual application of each line leaves the occasional random flick of colour to energise the design. Finally, careful control of the kiln atmosphere during the second firing brings out the character of the ware, its colours and durable finish. Reduction of oxygen is the key to colour development. By reducing the availability of air to the flames at critical times in the firing schedule, the chemistry of the glazes is manipulated. This is what brings out the red from copper, and maintains the balance of the other colours. 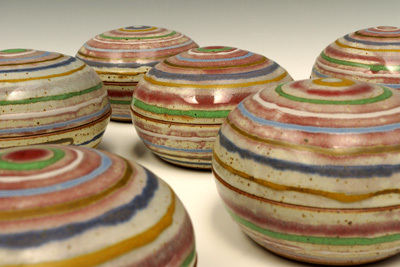 The end result is a stoneware which is physically strong and vibrant in appearance. The pots are warm in character and comfortable in the hand. Select images below for links to video. The Stoneware pottery is fired to 1280°c in a reducing atmosphere. All the Stoneware pottery is microwave and dishwasher safe. 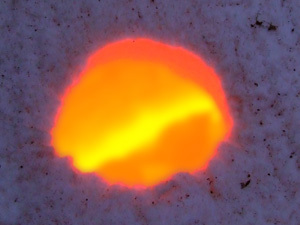 Raku pots are fired to 1000°c. Raku pottery is not for food use. Raku Bird Bath - with gold leaf. 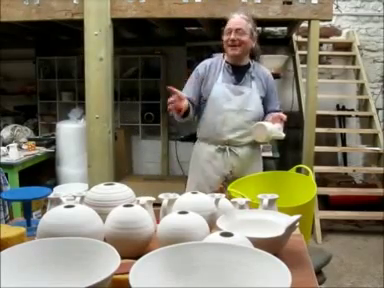 Below are some videos of Chris working at his studio at The Knott. These videos were made to be displayed on the stand at the craft fairs we exhibit at. They are part education, part advertising/PR. Shot on a happy day. 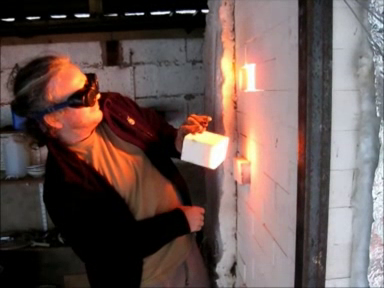 This video was made in the small hours of the morning - we were packing the kiln to meet a deadline as usual. That is why both Josiah and I look like zombies.